Watch brand Baume & Mercier has developed a new limited edition version of its latest addition to the Capeland, which you can buy in stores Tourneau. Model, made in vintage style, equipped with chronograph function, and function flyback, which will operate the buttons on the side of the hull. Stylish and elegant novelty presented in a round case diameter of 44 mm made of steel and is equipped with a clear legible dial. The glossy dial with copper shade are black Arabic numerals, three arrows to indicate the hours, minutes and seconds, blue counters, tachymeter scale and blue telemeter scale. Between the numbers 4 and 5 is a square aperture date. Despite a number of labels and scales, dial looks quite legible. Protects the domed sapphire crystal. New Capeland equipped with an automatic La Joux-Perret, where construction is used with a column wheel to control the start, stop and reset the chronograph. 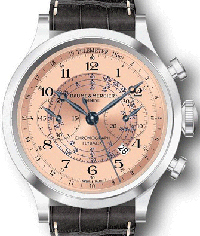 Capeland model of Baume & Mercier limited edition – 250 copies.